Maybe you've seen them. Around 3.30 p.m. they storm the local grocery store, Denner, buying Cokes, candy, and cigarettes. They are the school kids. But they will shop there no more. 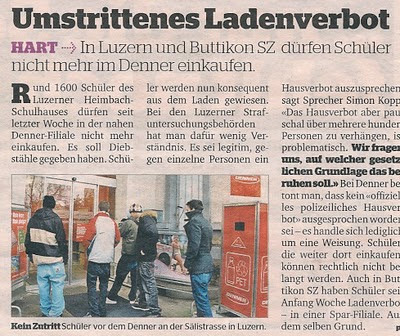 Yes, in towns across Switzerland, namely Lucerne and Buttikon (my personal favorite), school kids are being banned from the grocery store. Ouch. Apparently, there has been a lot of shoplifting at Denner and so, because of a few bad seeds, all kids are banned and will now have to explore more expensive places to buy their Cokes. All I can say is, wow. Can Swiss stores legally ban certain people from shopping? Isn't freedom of shopping protected under civil rights? I just can't see a store in the U.S. being allowed to ban certain customers post 1960s, but maybe I'm wrong. Oh, Switzerland. I guess if you can ban the building of minarets, it's not a big deal to ban a few school kids from shopping. Is it? A part of me enjoys witnessing a culture just throw political correctness out the window and do things that they want to do without caring about others. A small part. That feeling usually evaporates when I get pushed at the Migros. Mrs. Mac, your comment made me laugh out loud. I know what you're saying about enjoying a culture that just doesn't care about being PC. On one hand it's kind of refreshing. But yeah. Then you have a Migros Moment or get called an "Auslanderin" at the pool and it all becomes not so cool. And yes, juanita tortilla, let's bring on the bans. What else could we ban in Switzerland? Sadly enough, that was a whole article in a Swiss newspaper last week. (Hmm, I see another post coming). How about jackhammering before 7 am? I'd vote for that! In the small town where I grew up it was pretty common for restaurant hosts to refuse to seat high schoolers who arrived in groups of more than four. I know that's not exactly the same thing, but (in their defense) it's not just the Swiss who target teenagers. I'm sure I'll have a Migros moment today to make up for this comment. Thanks for the comment. That's interesting about the restaurants. I know some of the ones where I grew up weren't too happy about big groups of teenagers either. They never refused us, but you could tell they wanted to. I guess if stores and restaurants are private businesses then they can do what they want. Personally, the less teenagers my local Denner has, the happier I am to shop there. Long-time reader, first time commenter de-lurking to thank you for allowing me to add "Buttikon" to my list of funny Swiss place names. I just moved to ZH from the States a few weeks ago, but so far I have been unable to say or hear the town name "Bubikon" without laughing. And more on-topic, I've been surprised reading the want-ads here that they can stipulate the ages (and nationalities) of the people that businesses want to hire. Is this typical in the US and I just never noticed? And yes, what a topic: Employment in Switzerland. Yes, they can stipulate age ranges and sexes. You also must put your birthday and photo on your resume. This is not typical in the U.S. The company would be sued by now for doing so. Ah, lawyers in the U.S. That's a whole other topic too. Politically correct they are not. I'm still reeling, having just learned today that diverse popular music styles from Hip Hop to R&B to Reggae are filed under the name "Black Music" in Blick am Abend (and maybe everywhere else too?) Does that make everything else "White Music? "Or the similarly vague "Asian Music?" That's hilarious (and terrible). I never noticed that. Will have a closer look the next time I pick up that paper! I am Manish from India. I came to this page while surfing about Swiss Democracy. I'll be grateful if you could help us in learning.